As the owners of the condition, we somehow have to keep on doing everything we do, multiple times a day, every day of our lives. Taking a step back for a moment and putting that in context, if you were diagnosed at 13, like I was, and live a normal life expectancy, lets say you make it to 81.5 years (UK for Type 1s diagnosed at 20 is 66 years, however I have no intention of giving up that early so I’ve taken the UK male average instead). If you are using MDI for that period you’ll be doing 125,000 injections and n times that many blood tests. We’re talking about getting on for 500,000. Yes, that really is half a million blood tests if you do as many as NICE recommends. If you earned the UK average wage, it would take you nearly 19 years to get to that level in GBP. Nearly half your working life. So when you look at Diabetes in simple numbers, some of them can be truly overwhelming. it is also, of course, incessant. There is never a day off. You can’t just wake up one morning and go “Oh, today I fancy having a day when I don’t have diabetes”. It doesn’t work like that. Is it any wonder that psychological problems exist with many type 1s, and that’s only those of us lucky enough to be born into countries where we can get our hands on insulin. As I meander through this, I’m trying to identify clearly the things that make us different. Things we have to do all the time that those who aren’t, don’t. Don’t worry, I’m making a point. Slowly. A little like treating diabetes. I recently met a number of other type 1s, few of whom really use the internet in relation to their condition or pay any attention to the Diabetes Online Community. The rate of blood testing was incredibly low and more disturbingly, the use of insulin in some cases was based on “Do I feel high?”, with one person occasionally not taking insulin because they didn’t feel they needed it. We see all the stuff about the National Diabetes Audit, but the reality is so far from what many of us in the DOC live. I put my hand up. I went through a similar period. It lasted a good few years. Sparse glucose testing, estimating carbs and injecting based on that. My Hba1Cs were “okay” (in the 7s) and I didn’t feel ill, so I completely understand the approach that many take. Testing a couple of times a day (based on advice when I was diagnosed on a twice daily regimen), We often call it “Living with Diabetes” and we kid ourselves that this is fine, there’s nothing wrong with it. Yet we know there is something wrong with it. We know that we should be paying more attention. We know there is a risk of complications, but that is “manana”. It won’t happen to us. We know that we hold our life in our hands, and that’s a huge thing for a thirteen year old to be told, let alone someone who is 23 and thought they were immortal. As a child growing up, we come to realise that we are different and that, around the age of ten or eleven, we, unlike our friends, are not immortal. And we grieve. We grieve the loss of immortality. The realisation of mortality. The loss of freedom. Our own certainty of death. Call it what you will. I was trying to map what happens in Type 1s to this, and struggled. I’m not sure that this is really a good model of what happens to people. I think it tries to bucket what happens when you grieve and it certainly isn’t a cyclical process, but that’s for another post. The reality of living with type 1 is that many people get to a stage where they understand that they have T1, but push it to the background and do the minimum they need to to avoid ending up in hospital too regularly. They certainly don’t go through these as a process. Many get stuck between denial and depression, with a bit of bargaining going on. Eventually they may move, begrudgingly to acceptance, but change only really occurs when you get to the latter two points. Acceptance can simply be not railing against it all the time. As a result, until they start to readjust, they continue with the less positive behaviours. 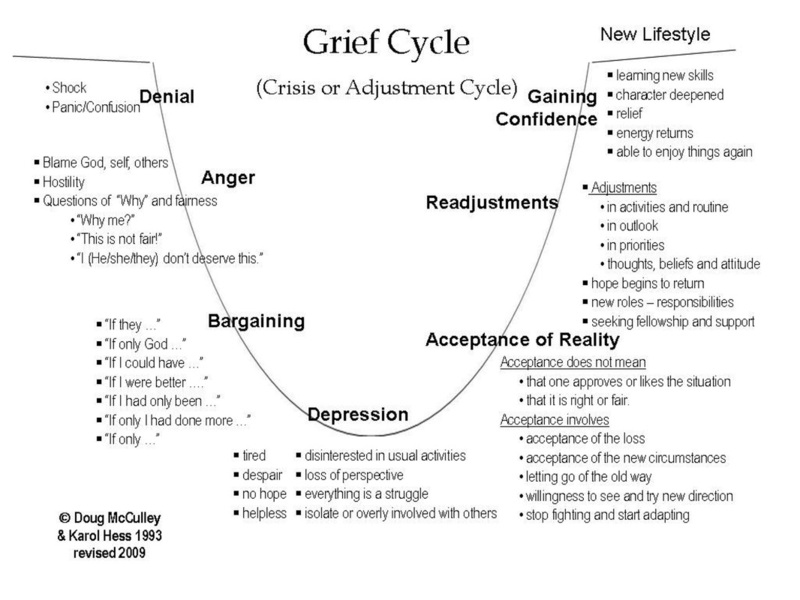 The sad fact is that long term chronic conditions make it hard to move into the latter stages, and even then, people cycle back into earlier stages when various life events may happen and sudden realisations hit again that you have to do this for life, multiple times a day and it will never turn off or get better. We call it “Burnout”. But there’s more. It’s not just about grief and the loss of a former life or the loss of immortality. It’s also dealing with the living with diabetes. The more that someone struggles with the day-to-day of dealing with diabetes, the worse they tend to be, and there is a evidence that this “Diabetes Distress” is a reasonably common issue. What’s worse is that the more distress a patient suffers, the worse their Hba1C tends to be. The saddest aspect of diabetes distress is that it’s only been in the last couple of years that it has been properly recognised as a valid psychological concern. The studies are few and far between. This is one that is based on interviews with a fairly small sample but it gives a revealing view into the thoughts of “young adults” – that is those in their 20s and 30s. They mostly point to the issues with being able to accept the condition and live with it in society. What’s also fascinating is the benefits seen from peer to peer support. But how do I relate to this? For me something changed about ten years ago. I’ve been trying to put my finger on what it was, and when I look back at my life story, it was a relationship (that has persevered for 12 years) that changed the way I looked after myself. I now had an external reason to take more care. I still have days when I eat badly and cause stupid spikes and troughs. I know they do me no good, but they are far less frequent. And that brings me to the crux of this post. How do you motivate someone to take the steps forward? What are the key ways of helping people to achieve a state where they are willing to make readjustments that will help them. I realise that it’s a long post to get to the point, but it’s a complex problem. In some cases, it’s catching them with education early enough to help them understand what’s happening to them and giving the power to make the right choices. It’s also couching that in terms of living a normal life, having kids, watching them grow up and seeing them live to a ripe old age. It’s encouraging them that they can travel the world, play in a band, become a celebrity or run their own business. It’s imbuing the belief that life can and will go on in a positive manner. We all know about complications, but negative references almost never produce positive outcomes. While we should be aware, they won’t drive behaviour change. More often than not it’s an external impetus that makes the difference. A relationship, wanting kids, seeing someone you love die, the onset of unexpected complications. There are many. The big question is how do you move this impetus to just after diagnosis instead of 10 years later? And secondly, what interventions are required for distress? It’s realising that in order to help someone through this, you have to accept they are suffering a number of psychological issues and these can last a lifetime. There is research going on now into this topic, and the realisation has only occurred recently that some people suffer post traumatic stress disorder from a type 1 diagnosis 40 years later. The trauma can be that extreme. As care of T1 patients progresses, at an early stage in the lifecycle of living with the condition, I expect that counselling and psychological help will be offered to all as a standard part of the initial diagnosis. The coming to terms and becoming positive about the condition needs to be encouraged as soon as possible after diagnosis to aid in the better management as you go through life. In many ways the basics of taking a bunch of numbers and making sure they work together is straightforward. Untangling the pain, loss and emotion associated with knowing you’ll have to make those numbers add up to zero for the rest of your life and it won’t always be easy is a great deal more complex. I feel fortunate. I’ve got to the point where I have been able to make those changes, but many more haven’t, and those of us who deal with people who are newly diagnosed need to be able to recognise these concerns and feelings and to help people come to terms with them. We should expose the soft underbelly of ourselves, showing that we’ve been through it, that we’ve got the scars and that there’s a way through to the other side. We can and must show the positive side of looking after ourselves to help ease people into the process. If there’s one thing the DOC can do its to get out into the real world and show that short life expectancy and complications are not inevitable. That life goes on in a sane and nearly normal way, and it’s not an impossibility. Whilst showing that it’s possible to live with diabetes, with peer to peer support we can also help alleviate diabetes distress. We can enable change. u r doing a great service by posting all these.Keep up ur good work mate! Glad you like them! Keep coming back and reading.